1.xv is 180MB, and it's supposed to be a video of about 45 minutes. Thanks! I compiled the reverse engineered converter you linked to in github and it was able to successfully convert the file (1.xv) and it also converted a lot of other videos perfectly to FLV, but about a third of them gave me the error in line 61 "File format is incorrect". I have checked out this converter and it is a funny one. It descrambles the actual FLV header way down in the file and replaces the header with an "unknown FLV chunk" (type 255) so it will be properly skipped. 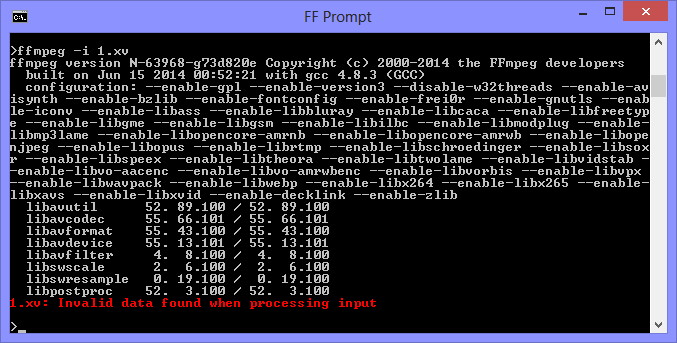 The file format starts with the magic XLVF, seems to have a 32 bit pointer to the actual data at position 8 (e.g. 0x00200000 in the two files). After that a URL to the original .flv follows and perhaps some index data. After that, it can be read as an FLV file. (or remuxed to a file which apparently contains the complete video and is perfectly playable). implying you can't probe bitrate or duration. Would it not suffice to recognize these files properly as FLV in the first step?